Dental veneers are an aesthetic restoration that’s used to change what your smile looks like from the outside. Made from porcelain or a composite resin, the thin veneer is applied to the front of each tooth to alter its shape, size and colour. Porcelain veneers provide optimal aesthetics and customisation options. Each of these restorations is handmade in a lab, so a total of two visits to 7 Pearls Dental are needed to complete your treatment. After prepping your teeth, we’ll take a mould and send it to the ceramist. About 1-2 weeks later, your permanent veneers are ready to bond over your smile. We’ll want to make sure that you’re thrilled with how your results look, so part of your porcelain veneer process will include a try-in that allows you to preview the fit and feel before we cement anything into place. If you’re happy with the outcome and veneer design, we’ll proceed to cement them onto your teeth. Otherwise, we’ll make modifications or send the restorations back to the lab to have them readjusted at no extra charge. Veneers made of composite resin can be prepped and placed in one sitting. First, we gently reshape the tooth so that the resin bonds closely as possible. Next, we shape the pre-selected shade directly onto your tooth enamel to fill in any flaws or discrepancies in your smile. Finally, the material is cured with a bright light. In most cases, composite veneers are recommended for limited spaces affecting one or only a few teeth. The material’s more opaque appearance is aesthetically pleasing, but not ideal for an entire smile makeover. 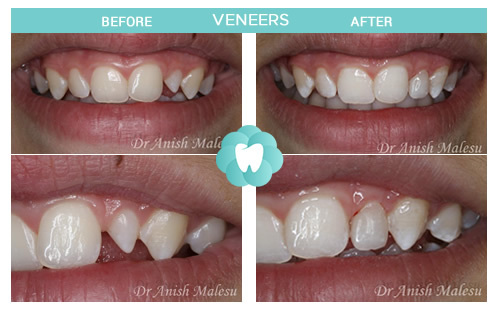 The reason so many people choose cosmetic veneers is because of their dramatic and fast results. In just a couple of trips to our office, you can have an entirely new smile. 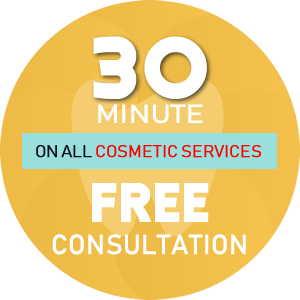 During your consultation, we’ll discuss what characteristics you like and dislike about your current appearance. From there, we’ll review what changes can be made to enhance the way your teeth look. After the colour, shape and size of your veneers are selected, we’ll proceed to plan the treatment and financing process. Giving yourself the gift of a beautiful smile is priceless. Some of our patients elect to have veneers for a big upcoming event, such as a wedding or retirement. Others want to look their best when they’re climbing their career ladder or re-entering the dating scene. Veneers are a personal decision and experience; only you can decide if the time is right for a smile makeover! Request your free dental veneers evaluation to find out if you qualify for a smile makeover.